Starbucks Registers Down: All Stores. I dropped by the Starbucks Reserve Roastery and Tasting Room after work today and ordered a tall pour over of Starbucks Pantheon Blend and a chocolate truffle cookie. A little later, I got an iced tea. It was all on the house. The Starbucks registers are down, as I write this at 7:30 PM on Friday the 24th of April. 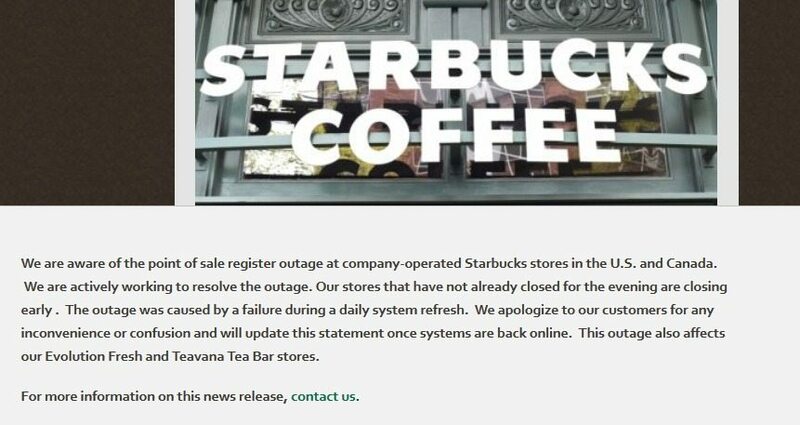 The Starbucks newsroom posted this official, but short, announcement. In bold print it says “stores will remain open” but then in the update itself, states the stores are closing early. I don’t know which it is. I assume that local district managers will have to make that call. I got an email from a Facebook friend that she was in a store in Bellevue, Washington when the registers went down at about 3:00 PM today. She enjoyed free food and beverage while at the store. From what I can, Seattle stores are generously giving away food and beverage. I liked his way of thinking. I know that Starbucks can absorb this. It’s clear that Starbucks is so huge and profitable, they can absorb a lot – such as billions in damages to Kraft. Having said that, I don’t want to make light of this situation. Don’t think you can walk into a Starbucks right now and walk away with a free pound of coffee. And it’s absolutely clear, that five or more hours of registers down across the world does represent a loss. And you cannot walk into a Starbucks and walk out with free merchandise, such as mugs, tumblers, or anything like that. I do think that Starbucks is taking a high road. While it’s tough to watch food being given out, much of it might be thrown out at the end of the evening anyways. If you are customer, one thing I hope you’ll learn from this is that Starbucks will surprise and delight you, and is generous to customers. If you’re a partner, trust and know that Starbucks hopes that you’ll create great customer moments and that Starbucks will take care of itself. I have no doubt, if they need to shut stores they will. If they need to mitigate damages by limiting free drinks to just iced tea, hot tea, or brewed coffee, they will. If you are a customer, don’t be surprised if Starbucks does these things to mitigate loss. I Predict: Starbucks Stars Earned Based Upon Dollars Spent. The $1 off Starbucks Perfect Oatmeal card – A current promotion and a great deal! My local Starbucks store #6676 in Vista, CA is writing down all transactions including merchandise on a paper log. Only accepting cash as payment and MSR members like me who purchased a VIA Caramel Iced Coffee (because of the new packaging) had to pay cash with no star. The 25% discount applied when presented the Starbucks Card. Another store about 2 miles away has baristas outside the store giving away free pastries, bistro boxes, sandwiches, and salads. Also, a big portable container of Pike Place Roast is outside with Tall cups of coffee for free. The cafe is open to customers but one can’t purchase handcrafted beverages or merch at this store. This is what I have seen after driving around running errands. I am in district 1015 in San Diego county in the city of Vista, CA. So, like you stated above it is up to each district and stoe manager to decide how they want to handle this situation. Edit: the 25% off AHC discount was applied with a Calculator for the 25% off the retail price. i arrived right at the very beginning of this (you can see this on my instagram, fb, and so on). i felt bad. then justin came to join me, and rather than take advantage of this situation, we left a tip that covered the price of my drink, and we left. we figured it was the right thing to do. I see it as they had nothing to lose. Either they refuse to sell perishable items or they give their inconvenienced loyal customers a pleasant surprise. It does not surprise me they handled it like this. Good for them. At the end of the day, they still serve overpriced coffee and pastries. Lol kudos! The two Starbucks I stopped by were all closed or closing. One let people stay but was not selling any product, other than giving away perishables. The other closed up shop several hours early. I think that much fewer people took advance of this “flash sale” than Twitter and social media may have you believe. The store I was at in Simi Valley, CA didn’t offer food only a choice of hot or cold coffee or tea. The person ahead of me wanted hot chocolate & was told no, I was also told no fraps or espresso drinks either. I only like dark roast & the best they could offer was a Tribute pour over which is a med roast. Personally I though the staff could have been a bit more friendly about it & they should have posted something on the door before I walked in & listened to her exhausted spiel that you could tell she was tired of repeating. It’s all good it’s not the end of the world, but could have been handled better. I was also told they couldn’t even call the help desk, not sure why she told me that? I am store #13726 in Irving, TX…we initially experienced the outage about 5:30 pm and did surprise and delight until we were told to close at 8:30 pm. Because of the crazy weather we didn’t see very many customers. In fact, initially we thought the outage was weather related. I am very proud to work for a company that takes a situation like this and turns it in to an opportunity to spread good will to the public rather than just turning people away. I went into a Western WA store after hearing about the outage on the radio. I had planned on going before that, but this made me hurry a little! One person ordered before I did and was then told that his order was “on the house “. I ordered my frappucino (one size larger than usual) and after she asked, “is that all?”, a vanilla mini scone. It was free! It was easy! It was handled beautifully at that store. I will be back!